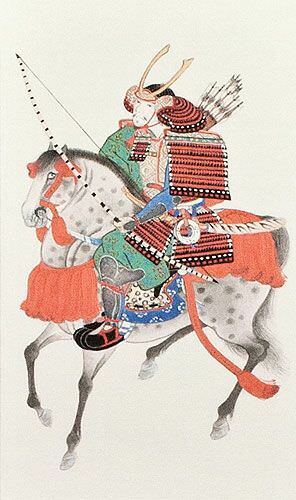 Artwork Panel: 29.5cm x 48.6cm ≈ 11½" x 19"
Silk/Brocade: 38.6cm x 112cm ≈ 15¼" x 44"
This features a Japanese Samurai mounted on a fine horse. This is a mechanically-printed reproduction. When I made this, I was just testing my new giclee fine art printer. The original artwork dates back to the year 1878 in Japan, but I don't have a lot of information about it. The paper this is printed on was made and pressed by hand, and the silk wall scroll is handmade at my workshop in Beijing, China.